Here, in Sawley, a place of remembrance has been created as a permanent reminder of the sacrifices of those from the village who endured WW1. 28 names are recorded from Sawley parish, or in connection with it, of those who served in the Great War of 1914-1918. 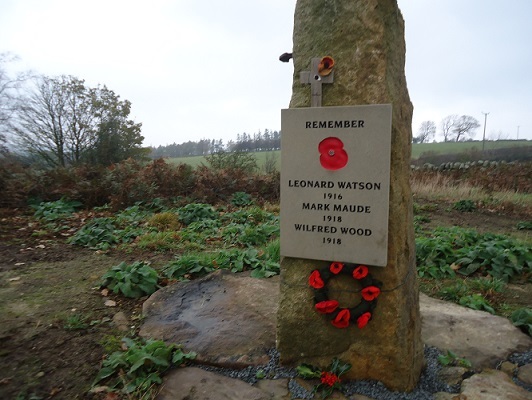 The three that died in battle are Leonard Watson, Mark Maude and Wilfred Wood. These three names are now engraved on a remembrance stone that is set in a peaceful and reflective place within Picking Gill Nature Reserve, Sawley — a four acre nature reserve cared for and looked after by the communities of Eavestone, Grantley, Risplith, Sawley and Skelding. The Place of Remembrance serves as a pertinent reminder of the affect the Great War had on all communities throughout the British Isles. Set in a clearing on top of a small hill overlooking the nature reserve this place embodies a reflective and sombre aura. Logwise was asked to donate and build a bench as a means to sit down and contemplate in this commemorative space. The bench is made from a six foot length of timber taken from the trunk of a local beech tree which was sawn in half and then dried before the sawn timber was treated with wax to protect the wood from the rain and sun; sat on two large stones at the side of the clearing it overlooks both the nature reserve and the commemorative stone. We also carved a single poppy flower in one corner — hopefully this is a fitting commemorative tribute on a bench that will be used often.